Stroke remains one of the world’s leading causes of disability. What are you doing to promote best treatment and assessment for stroke? The mission of the Stroke Interdisciplinary Special Interest Group (Stroke ISIG) is to be a leader in interdisciplinary stroke rehabilitation—both in clinical practice and research—by promoting high standards of rehabilitation practice, education, and research among professionals with common interests in stroke. The work of the STROKE ISIG is accomplished through its task forces and the ACRM Annual Conference events. Participation in four very active task forces is open to all STROKE ISIG members and new members are welcome. 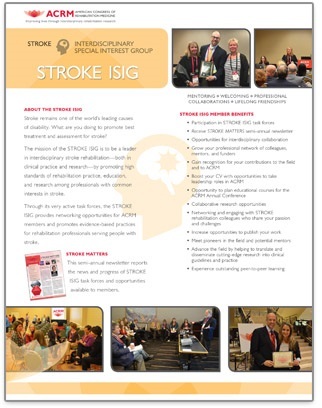 If you’re thinking about joining the STROKE ISIG for the first time, contact any of the executive committee members or task force chairs to learn how your participation can make a meaningful difference in the field of Stroke rehabilitation. Membership is growing – Join us! One of the most valuable benefits of ACRM membership is the opportunity to participate in the many interdisciplinary special interest groups and networking groups. Not sure ACRM membership is right for you? Consider an ISIG Only membership. It’s fun, it’s informative — Join us! Virtual Happy Hours are webinars featuring expert speakers in all areas of stroke rehabilitation. This is an opportunity to learn from and interact with the best in our field! SAVE THE DATE for the third Thursday of each month from 5:00 – 6:00 PM ET. for more details and reminders about this exciting event! WHY PRESENT AT THE ACRM ANNUAL CONFERENCE? Heather Tanksley, MOT, OTR/L, interviewed clinician colleagues who participated in educational sessions at past ACRM conferences to share insights about their experiences. You might be surprised by their answers! Q: What did you enjoy most about presenting at the ACRM conference this year? A: It was refreshing to present as an SLP to a wider range of professionals than we usually get to interact with. The questions people had were more interesting as a result. The Member Guide to Product Development describes ACRM products, i.e., fact sheets, journal articles, manuals, and the procedure used by ACRM groups and committees to develop them. The guide includes a Product Development Worksheet and how to request a Product Review.